As many of you know, Phantom 2 began rolling out on April 29, 2015, just days after the mobile-friendly update was released. Phantom 2 was a big update that Google initially denied. During my analysis of the update, I saw a lot of movement across sites dealing with content quality problems. It was clear from the beginning that the algorithm update was focused on content quality (like Panda). That’s one of the reasons many people (including myself) initially believed it was a Panda update. Once Google confirmed the update, they explained that it was a change to its core ranking algorithm with how it assessed “quality”. Even though Google explained that Phantom was part of its core ranking algorithm, I had a feeling that websites would not be able to recover quickly. The reason? I had seen this before, specifically with the original Phantom update in May of 2013. Phantom 2 was eerily similar to Phantom 1 (and rolled out almost 2 years to the day that Phantom 1 rolled out). Interesting timing to say the least. With Phantom 1, I also saw the update target content quality problems. The companies I helped with fresh hits had a dangerous recipe of user engagement issues, content quality problems, and technical issues that all led to significant drops in organic search traffic. It took nearly three months before I saw the first Phantom 1 recovery, with others following as time went on. It took a lot of work to see recovery from Phantom 1… it was not a trivial undertaking. And I expect Phantom 2 remediation and recovery to follow suit. Actually, we are already over two months out from the Phantom 2 update (late April/early May), and I haven’t seen any major recoveries yet. That being said, I’ve seen a lot of movement on specific dates following Phantom. That includes both additional drops in traffic or sudden jumps for Phantom 2 victims. And that’s the topic of this post – Phantom tremors. After Panda 4.0 in May of 2014, I saw what looked like near-weekly updates impacting Panda victims. 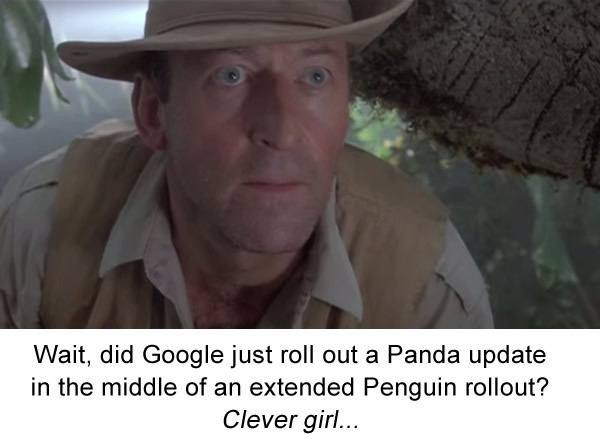 I called these updates Panda tremors, and they were confirmed by Google’s John Mueller. Basically, after Google pushes a major update, it can refine and tweak an algorithm and then push smaller updates (to ensure everything is working the way they want). 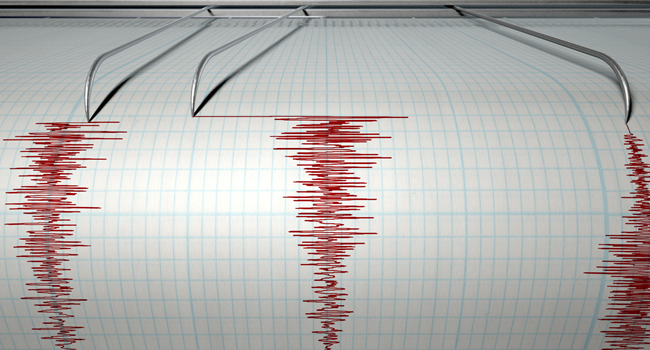 I saw many of those tremors after Panda 4.0. Well, Phantom 2 has been similar. I started seeing Phantom tremors soon after the initial rollout and I have seen several more over time. And most recently, I saw the latest Phantom tremor starting on 7/14/15. I’ve seen the impact with companies I am helping now, but I’ve also had new companies reach out to me explaining what they are seeing. And when tremors roll out, Phantom victims can see more impact (mostly negative based on my analysis, but there has been some positive movement). Remember, many Phantom victims have been impacted previously by Panda. For example, some sites that were still working to recover from Panda got hit by Phantom, while others that already recovered from Panda got hit too. Yes, some of those sites saw drops after fully recovering from Panda. For those sites still impacted by previous Panda updates that got hit by Phantom 2, it’s clearly not a great sign. We know that Phantom focuses on “quality” and so does Panda. I can’t imagine Phantom reacting negatively to your site, while Panda reacts positively. If that’s the case, then Google has an algo problem. Now, if a site has recovered from Panda and then saw negative impact from Phantom, then that does not bode well for the next Panda update. Phantom is clearly picking up quality problems, which could also contribute to a future Panda hit. We are eagerly awaiting the next Panda refresh so recent Phantom hits on sites that have recovered from Panda should be concerning. Great question, and it’s hard to say exactly. Google could be refining the algorithm and then rolling it out again. Or they could be adding more factors to Phantom and rolling it out. Or they could be adjusting the threshold for each factor. All three are possibilities. That’s why it’s so important to get out of the gray area of Phantom. 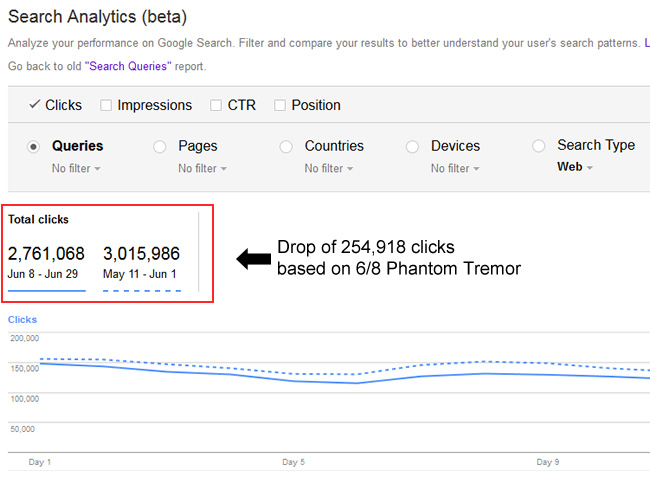 I wrote a post recently about the SEO nuclear option and how it relates to both Panda and Phantom hits. Let’s face it, with multiple major quality algorithms running like Phantom and Panda, it’s ultra-important for websites to identify and fix all quality problems riddling their sites. If not, then they can see more impact. And in a worst-case scenario, they could get hit by both Phantom and Panda, which is what I call Phantanda. And although Phantanda sounds like a soda or rock band, it’s not cool or fun. You don’t want to experience it. Is Phantom The Real-time Panda? In my Phantanda post, I brought up the possibility that Phantom was actually the migration of Panda (or Panda factors) to Google’s real-time algorithm. It’s entirely possible this is the case. I’ve analyzed many sites hit by Phantom 2 and every quality problem I surfaced would have been picked up by a thorough Panda audit. The factors are extremely similar…. almost identical actually. By the way, after Phantom 2 rolled out on 4/29, Josh Bachynski tweeted a similar thought. I said at the time that he was on to something… and I still believe that. And with Google having all sorts of problems with Panda, this makes even more sense. For all we know, Panda might have problems with Phantom (as Phantom is part of Google’s core ranking algorithm and also focuses on quality). If that’s the case, then the “technical problems” Google has explained could be Panda and Phantom at odds with one another. That’s total speculation, but there are now two quality cowboys in town. And to me, this SEO town might be too small for the both of them. It wouldn’t surprise me to find out that Panda is slowly being incorporated into Google’s core ranking algorithm. Remember, it’s been almost nine months since the last Panda update (10/24/14), while we’ve had multiple Phantom updates (the initial rollout and then several tremors). Hopefully we’ll find out soon what’s going on with Panda, and its relationship with Phantom. To quickly recap this post, if you were impacted by Phantom 2 in late April or early May, then you very well could have seen further impact during one or more Phantom tremors. I would check the dates I listed above and see if your site saw any drops or spikes during that timeframe. And more importantly, continue to make the right changes to your website. Audit your site through a quality lens, identify all problems riddling your site, and move quickly to rectify those problems. That’s how you can rid your site of both bamboo and ectoplasm. Good luck. Panda can be devastating. We all know that’s the case and it’s been documented to the nth degree since February of 2011. And now we have Phantom (AKA “The Quality Update”), which was a change to Google’s core ranking algorithm regarding how it assesses “quality”. Between the two, you can clearly see that Google is heavily focused on increasing the quality of the search results. For webmasters, it’s bad enough when you see a big drop in rankings and traffic from Panda alone. Some sites can drop by 60%+ when Panda rolls through. But for many sites riddled with bamboo, little did they know that Panda has a close friend named Phantom who has no problem kicking a site while it’s down. Since the end of April, I saw a number of sites that were already impacted by Panda see more negative impact from Phantom. And then there were some sites that recovered from Panda previously, only to get hit to some degree by Phantom. And as you can guess from the title of this post, I call these double-hits Phantanda. In this post, I’ll explain more about Phantanda, how it relates to Panda, I’ll introduce the SEO nuclear option, explain why it’s important, and then I’ll end by providing some recommendations for those that want to go nuclear. As mentioned above, Google now has a one-two quality punch which I’m calling Phantanda. It’s not a soft drink or a rock band, but instead, a devastating mix of algorithms that can wreak havoc on a website’s organic search traffic. In the past, Google used to roll out Panda monthly. That was great, since there were many opportunities for sites to recover as they made changes, removed bamboo, improved the user experience on their websites, and published higher quality content. But as many of you know, Panda hasn’t rolled out since 10/24/14. That’s a horrible situation for many battling the mighty Panda. Sure, Gary Illyes said the next Panda update is coming soon (within weeks), but it has still been way too long between Panda updates. And that’s especially the case when we saw weekly Panda tremors after Panda 4.0. The fact is we need more Panda updates and not less (as crazy as that sounds). Hopefully the next Panda update is right around the corner. We’ll see. From a Phantom standpoint, Google implemented changes to its core ranking algorithm with how it assessed “quality”. It was very similar to the first Phantom update, which was in May of 2013. Phantom 2 was eerily similar to Phantom 1 and I’ve done a boatload of research and work with both updates. The good news is that websites were able to recover from Phantom 1. The bad news is that it took months of remediation work (similar to Panda remediation). I believe the first recovery I saw took approximately three months, while others took longer. Based on my analysis of Phantom 2 (and my work helping companies that have been impacted), I believe the remediation and recovery process is similar to Phantom 1 (longer-term). And that make sense. The Quality Update (Phantom 2) rolled out on 4/29, so websites need enough time to audit, strategize, execute, and wait for Google to process those changes. Remember, Google needs to crawl and measure the changes. It’s not like going mobile-friendly, which is a binary test for now (yes or no). In my opinion, it’s much more complicated than that. In my opinion, Phantom remediation is very Panda-like. Take a long-term approach, truly understand the various quality problems riddling a website, and then take aggressive action to rectify those problems. And that leads me to the core point of this post – the nuclear option. I started referring to the nuclear option in June of 2013 when Google first started talking about Panda going real-time. I explained that if that was the case, then webmasters would have no idea what hit them. And that would make it harder to understand what caused the negative impact and how to fix the problem(s). When this happened, most people thought they were hit by Penguin, when in fact, they were hit by Panda. And that’s a horrible situation with the potential of disastrous results. Imagine nuking many of your links thinking you were hit by Penguin, when you really needed to improve content quality. I had many confused webmasters reach out to me after the 10/24 Panda update. And now we have Phantom throwing its hat in the ring. As mentioned earlier, many of the problems I surfaced with Phantom victims were extremely similar to Panda problems. For example, I would have surfaced the same problems when completing a thorough audit (whether a site was impacted by Panda or Phantom). Heck, for all we know Phantom is actually the beginning of Panda being incorporated into Google’s core ranking algorithm. It’s entirely possible. And of course we still have Penguin, with a release schedule less frequent than Halley’s comet passing earth. So based on what I just explained, what can a webmaster do when all of these algorithms are running around the web? Enter the nuclear option. 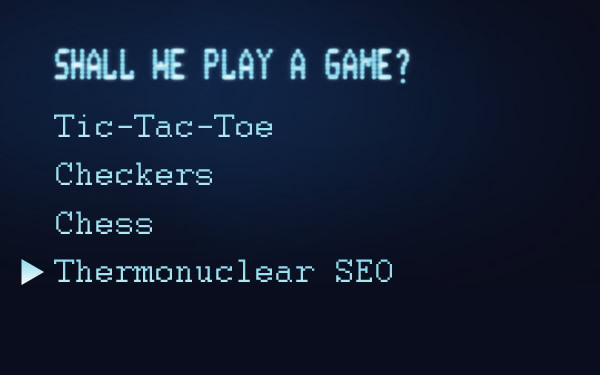 What Is The SEO Nuclear Option? Yes, it’s a lot of work, but again, it’s completely worth it in the long-term (in my opinion). The companies I’ve helped that decided to go down the nuclear path simply couldn’t take it anymore… They were tired of chasing algorithms, tinkering with urls, tweaking this, and then that, only to find themselves hit again by another algorithm update. The grey area of Panda or Phantom is enough to drive a webmaster insane. As you can imagine, pushing the giant red button is a big undertaking that should not be taken lightly. So based on my experience helping companies with the nuclear option, I’ve provided some recommendations below. My hope is that if you choose to go nuclear, you can follow these tips to ensure you maximize your efforts (and avoid launching duds). Long-Term Process – Understand that you are making changes to achieve long-term success. You are not looking for short-term wins. You want to avoid quality problems (and negative impact from quality algorithms) over the long-term. Understand that you might actually drop in the short-term until Google crawls, processes, and measures the changes. Extensive and Thorough Audit – Tackle on-site quality problems head-on. Have a thorough SEO audit completed through a quality lens. That should help identify problems that could be contributing to both Panda and Phantom. The audit should produce a clear remediation plan organized by priority. Nuke Those Links – Deal quickly and decisively with unnatural links. Have a thorough link audit completed. Identify all unnatural links and deal with them as quickly as possible. That includes removing, nofollowing, or disavowing unnatural links. Go Mobile-friendly – This is NOT just for Google. This is for users as well. Depending on your situation, you may choose to go responsive or you might choose separate mobile urls. Regardless, create a solid mobile user experience. It should pay off on several levels, including more organic search traffic, stronger engagement, more social sharing, and increased conversion. Redesigns Can Be Good (just be careful) – Don’t be afraid to redesign what needs to be improved. Website designs from 1997 will not suffice anymore. Cluttered and disorganized user experiences can kill you from a Panda and Phantom standpoint. Don’t be afraid to redesign your site, or various elements of the site. Just make sure you take the necessary steps to maintain search equity during the launch. Ask Humans (Yes, real people.) – I’ve helped a number of companies deal with Panda and Phantom hits that had serious engagement problems. For example, aggressive advertising, deceptive affiliate issues, horrible user experience, and other nasty problems). Those problems were abundantly clear to me, but not to the companies I was helping. Panda is about user happiness (and so is Phantom to an extent). Have unbiased real people go through your site. Have them provide feedback based on going through a task, or several tasks. Take their feedback to heart and then make changes. Avoid SEO Band-aids – Make the necessary changes no matter how big they are. If you want the greatest chance of recovery for the long-term, then you must be decisive and then execute. Band-aids lead to future algorithm hits. Big changes lead to success. With multiple quality algorithms crossing streams, it has never been more important to consider the SEO nuclear option. Pushing the giant red button can be a tough decision, but it can also rid your site of nasty quality problems that attract Pandas and Phantoms. And if there’s something worse than having bamboo on your site, it’s adding ectoplasm to the mix. Sure, choosing the SEO nuclear option is a bold move, but that might be exactly what you need to do.